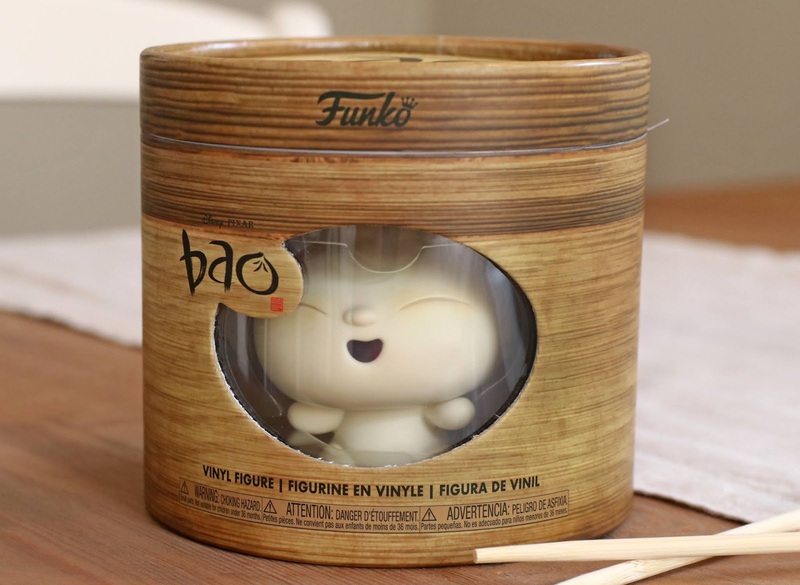 One of my most anticipated releases all summer, here we finally have the Funko Shop exclusive Bao Vinyl Figure! 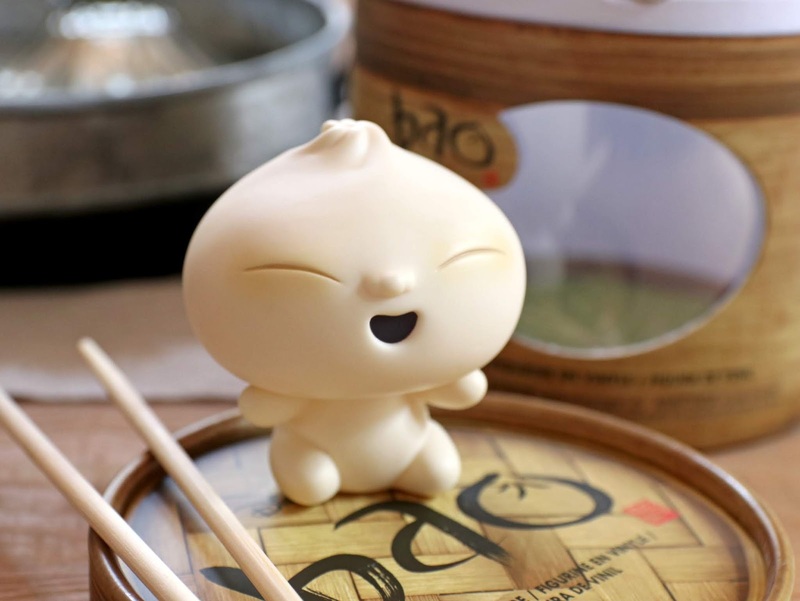 This adorable dumpling released last Wednesday the 22nd (which happened to also be our country's "National Bao Day"; yes, that's a thing now, in honor of the delicious Chinese steamed bun) exclusively on the Funko Shop website. 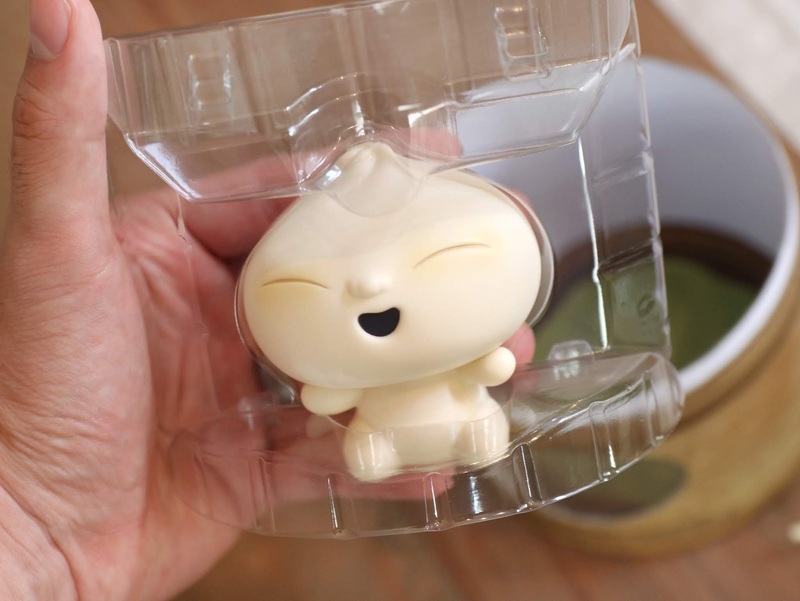 "Pop Up Shop" Funko products are usually a surprise release every Wednesday, are limited in quantity and sell out VERY FAST (sometimes in just several minutes). 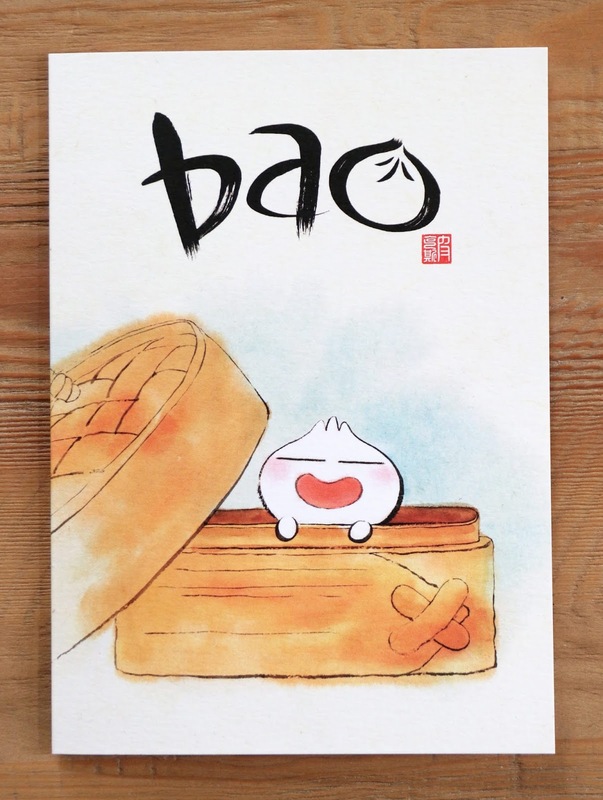 This Bao figure sold out in about 12 minutes, which was a bit longer than usual. Unfortunately I had no idea this was dropping on the site that morning and missed it by just a couple minutes! By the time I saw the page was live, he was sold out. After waiting all summer and wondering when it would hit the site, you can see how I'd be super bummed (especially since resellers on eBay charge an arm and a leg for these types of releases). This story ends well though as that very same night I was contacted by a representative from Funko who had set a few aside and wanted to send me one! A HUGE thank you to that Funko rep for this amazing gift. I feel so lucky and grateful! This figure is everything I was hoping it'd be. 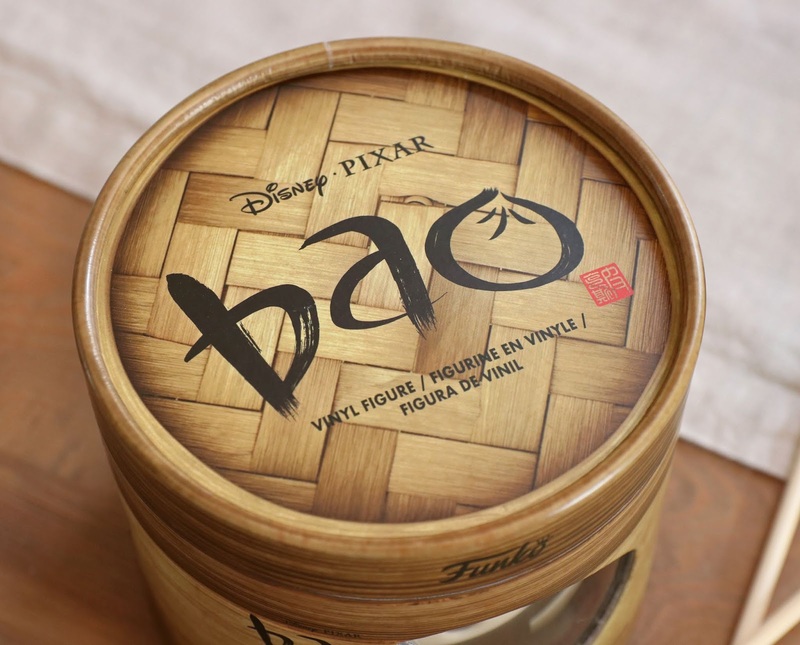 First I need to talk about the collectible packaging, modeled directly after the bamboo steamer basket (the traditional way of cooking bao) seen in the short film! From the window in the front (totally cute to see him peeking out), to the printed basket textures, to the film's logo— everything with the box is just perfect. Funko certainly kept serious collectors in mind as they designed all this. OK, lets open this guy up and take a look at him out of the "basket" and all his plastic protection. And I have to note, even a graphic of a piece of lettuce can be found inside at the bottom of the box (again, just like in the film)! 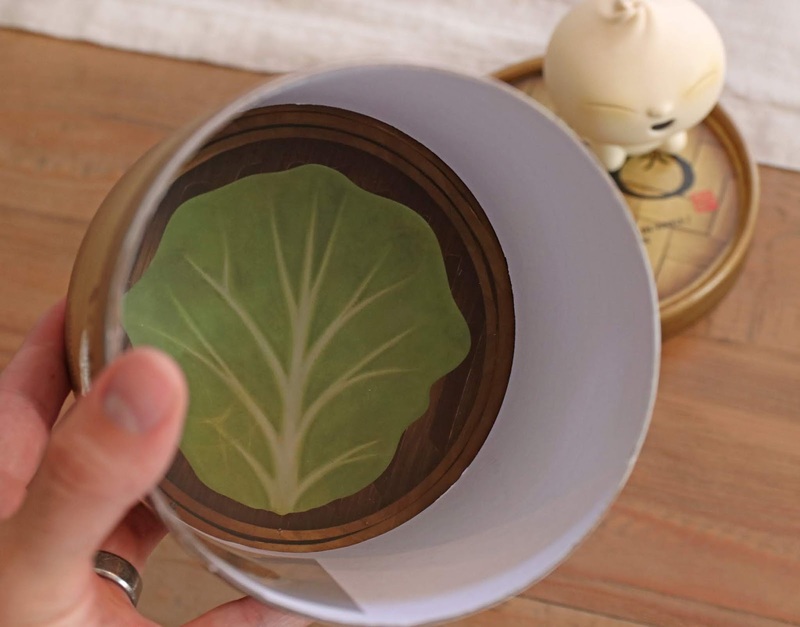 Lettuce is traditionally used at the bottom of the steamer basket when cooking bao to prevent the dumplings from sticking. Such a great detail. Now that he's fully removed from the packaging, just look at how cute and realistic he is. It's literally like he jumped out of the screen and into my hand! 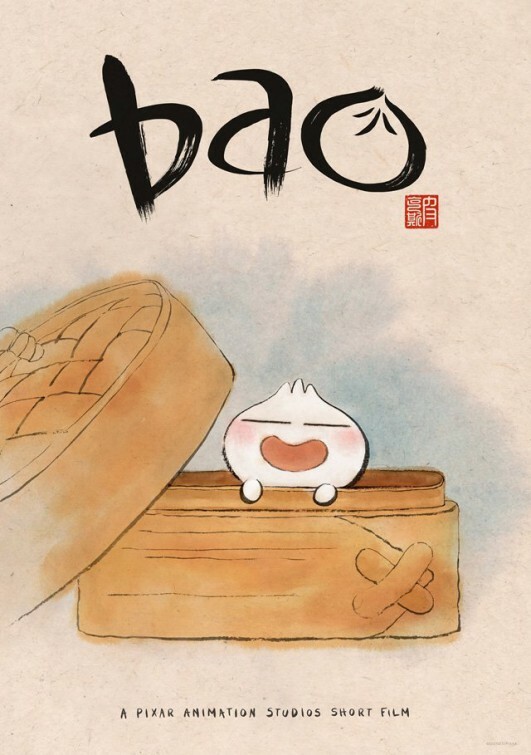 Compare with THIS screenshot from Bao. 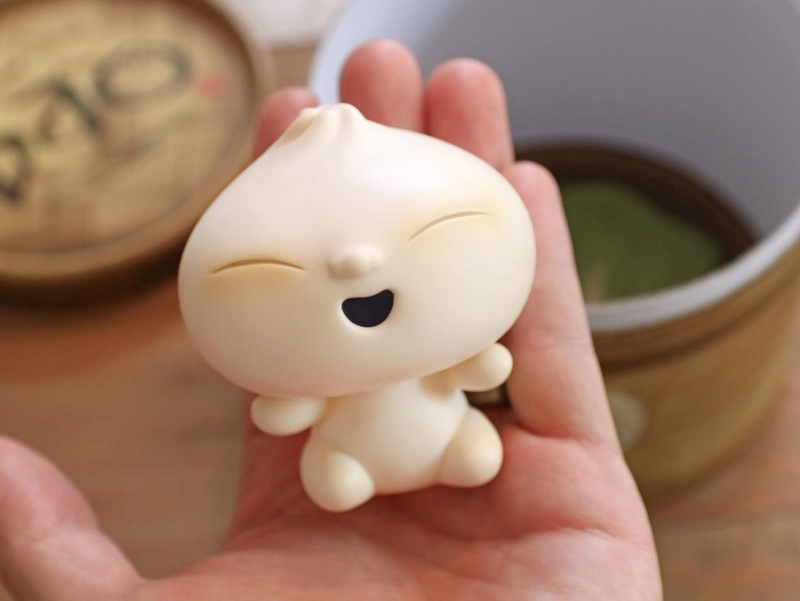 I'm glad Funko realized that there was no need for additional stylization since his design was already this chub and adorable in the film. I cannot picture Funko (or any company) doing a better job. Both the sculpt and the paint job are exquisite. Even his back...look at that little baby dumpling bum. It just cracks me up (wink;) and melts my heart at the same time! This figure measures just 3" tall x 2.5" wide and is very lightweight. 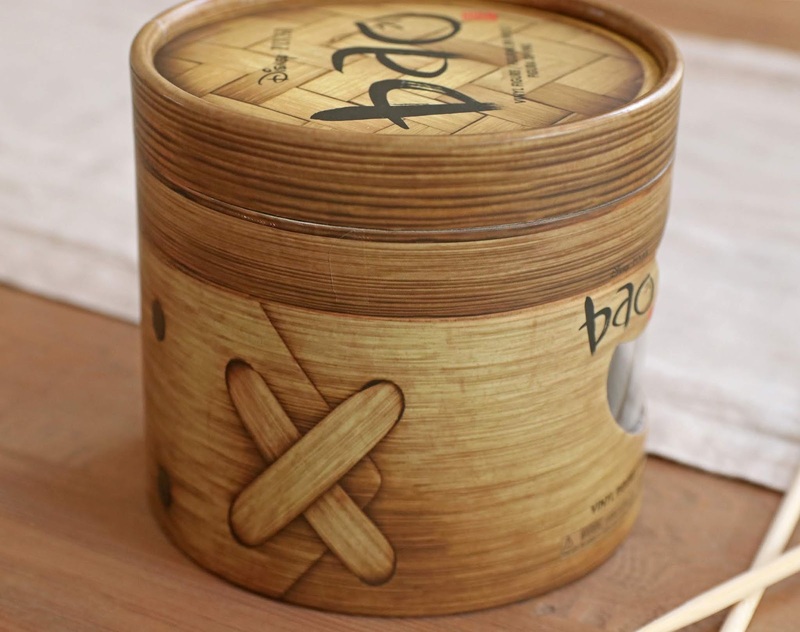 The basket box is 5" tall with a 5" diameter. Original retail price was $15. If you're a fan of this ambitious short film, I cannot recommend this figure enough if you're able to get your hands on it. Such a unique little treasure. If you weren't able to snag it on the Funko Shop website, be sure to check out THIS DIRECT LINK to current eBay listings. (it looks like they're selling between $60 and $70 right now). Let me know all your thoughts down below! Were you able to pick one of these up for your collection? Looking forward to hearing your own review in the comments. 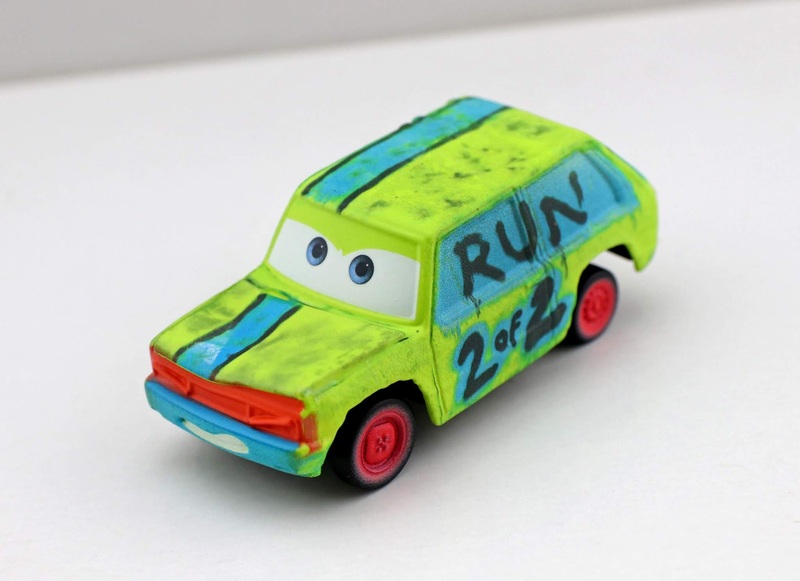 Over the past year, I've had a blast collecting and reviewing all the Pixar inspired "wooden collectibles" sets—which first debuted at last year's D23 Expo with an exclusive Toy Story Buzz & Woody set (see full post HERE). 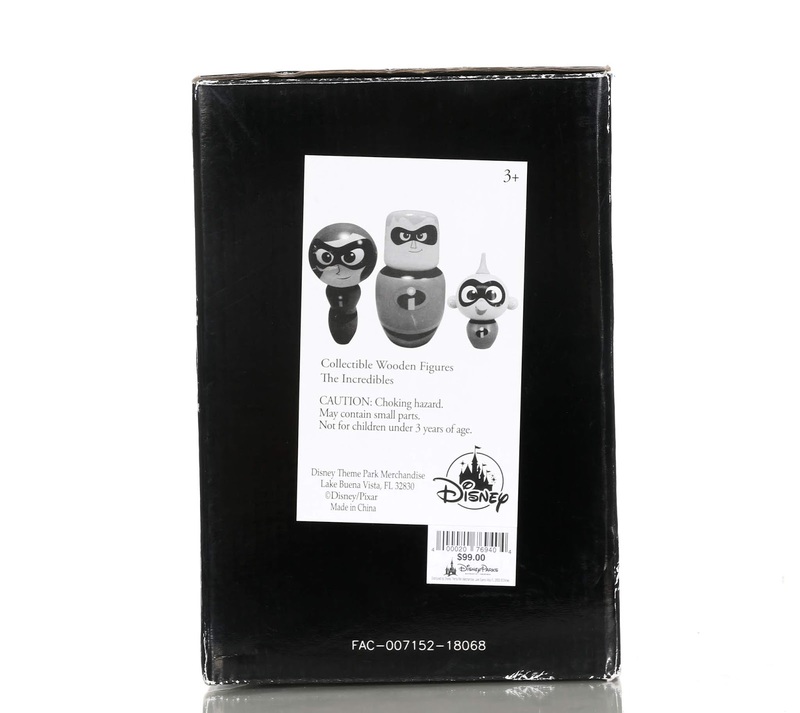 The line continued on the ShopDisney website shortly after that and into 2018 with additional releases such as Lightning McQueen & Cruz, Carl & Russell, Mike & Sulley and Wall·E & Eve; now new sets are showing up at Knick's Knacks (the adorable new Pixar themed shop at Disney California Adventure) including this The Incredibles 3-Pack featuring Mr. 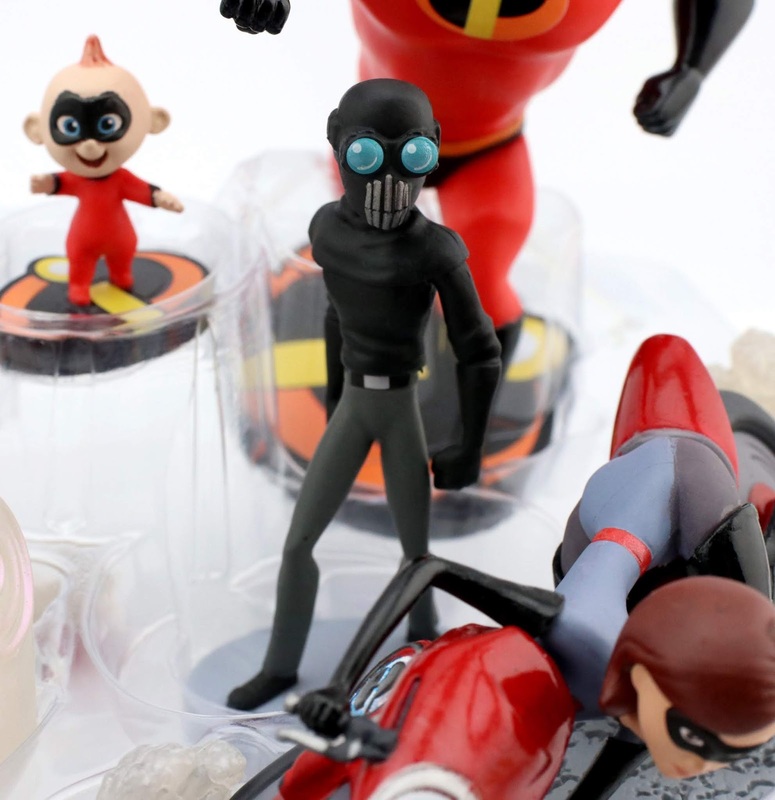 Incredible, Elastigirl and Jack-Jack! It's important to note that this "wooden collectibles" release does differ from the previous ones in a few ways. First of all, these ones here are larger in scale. When I first saw photos of them online, I figured they would match the scale of the other ShopDisney releases— but no. For example, Mr. Incredible is 7" tall and looks massive even next to the previously biggest character, which was Sulley. To put it even more into perspective, Jack-Jack is actually bigger than the original wooden Buzz Lightyear from last year. 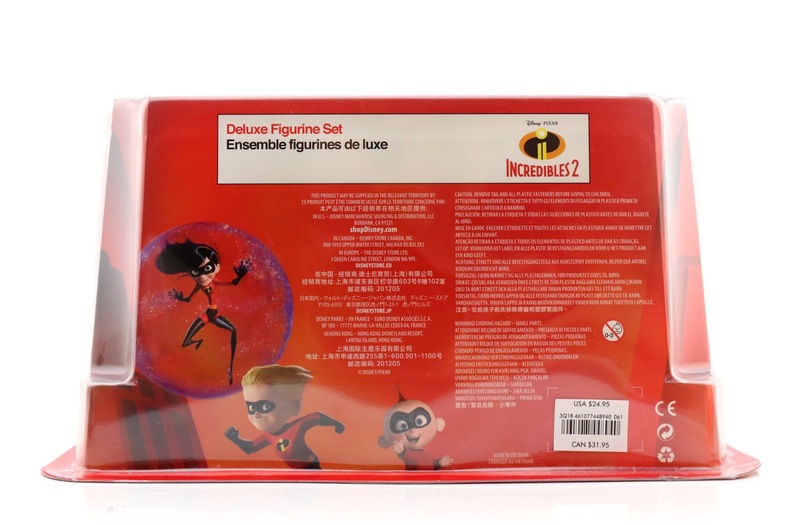 All the characters in this Incredibles set are just bulkier and heavier overall. Check out my Tweet HERE to see what I mean. The next big difference is the packaging. Unfortunately these ones did not come in a cool collector's window box with a sweet backdrop like all the others. Maybe they're just too big for something like that? You can see the basic black box they came in below with the $99.00 price tag (yes, they're a pretty penny for sure). The last big difference is that these are not numbered and I'm not sure if they're even considered "limited edition." The others came numbered (usually LE 300 or 400) and with a certificate of authenticity—these do not. I do like how their names are printed on the underside of them though; that's a new touch (interesting how they chose "Bob" and "Helen" instead of their hero names). As far as their sizes, Mr. 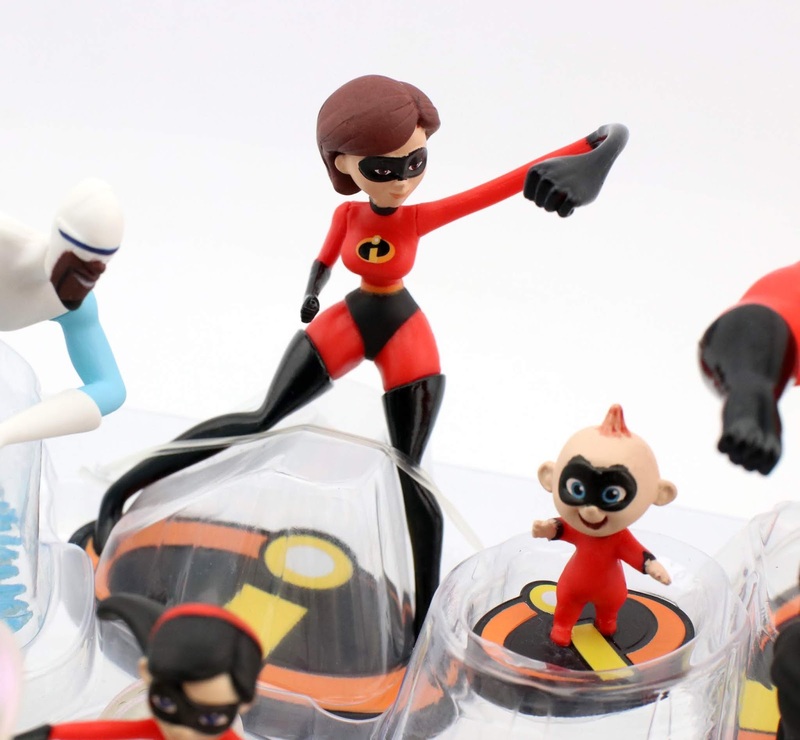 Incredible (as mentioned) is 7" tall, Elastigirl is 5.5" tall and Jack-Jack is 5" tall. Check them all out below in all their incredible glory! They look great. I love how they're stylized. 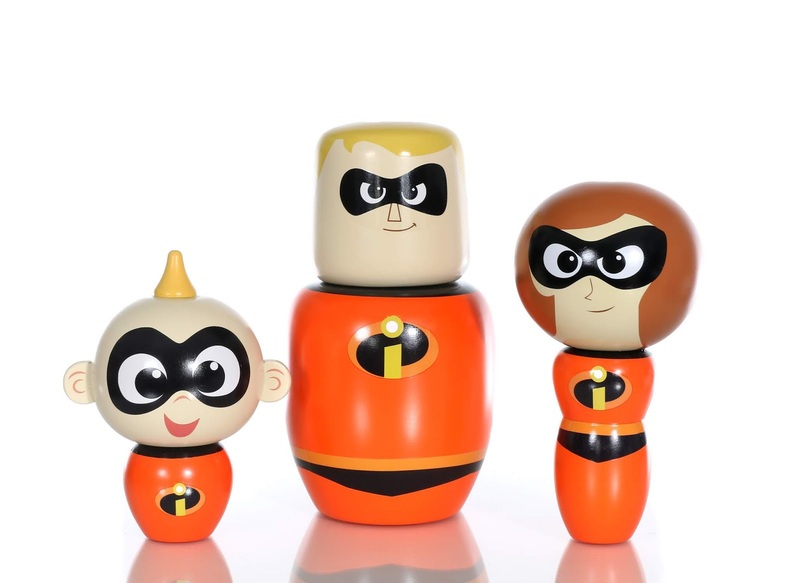 Once again my hat goes off to the designer, Jen Tan (Creative Director of Consumer Products at Pixar), who created the signature look of each and every one of these wooden collectibles. She did a fabulous job. In fact, you can see the entire character lineup she illustrated on her Instagram HERE. The designs have even been utilized on shirts (one from last year's D23 Expo and a couple available now only to annual pass holders during Disneyland's Pixar Fest) and Dooney and Bourke bags. The only thing that I don't love is that the paint color of their suites is way too orange. It's hard to tell from my photos, but trust me. They're straight up orange, especially when you put them next to something actually red. It's a small complaint, but I thought I'd mention it here to see if anyone else had the same thoughts on that. Other than that, they look amazing and feel quality crafted. 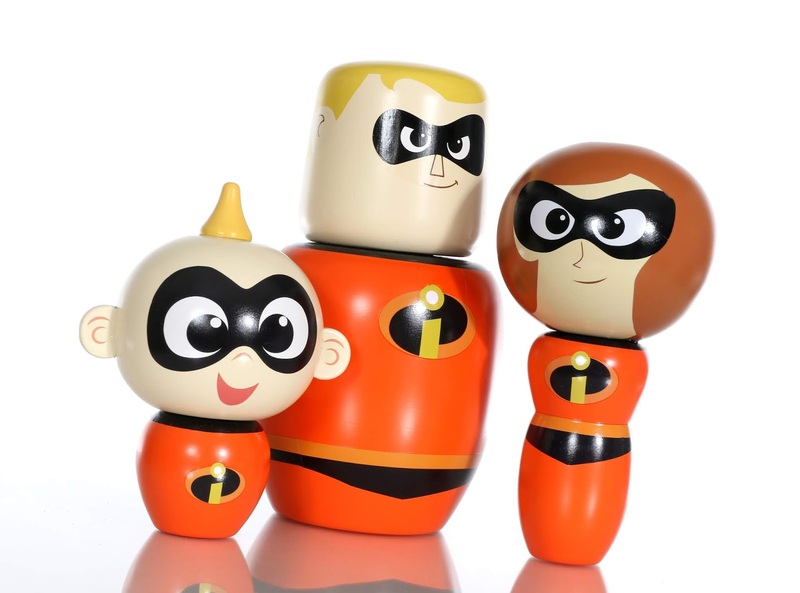 Lastly, I just wanted to note that there have been other new wooden collectible sets released this summer at Knick's Knacks, but they're just new larger scale versions of characters I already have with a few new additions. For example, there's a Buzz & Woody set (which adds Jessie), a Mike & Sulley set (which adds Boo) and apparently there's a new Carl & Russell set coming in September (which will add Dug). Bummer I won't be able to get my hands on those three new characters since they are part of $100 3-Packs. Let me know your thoughts below! 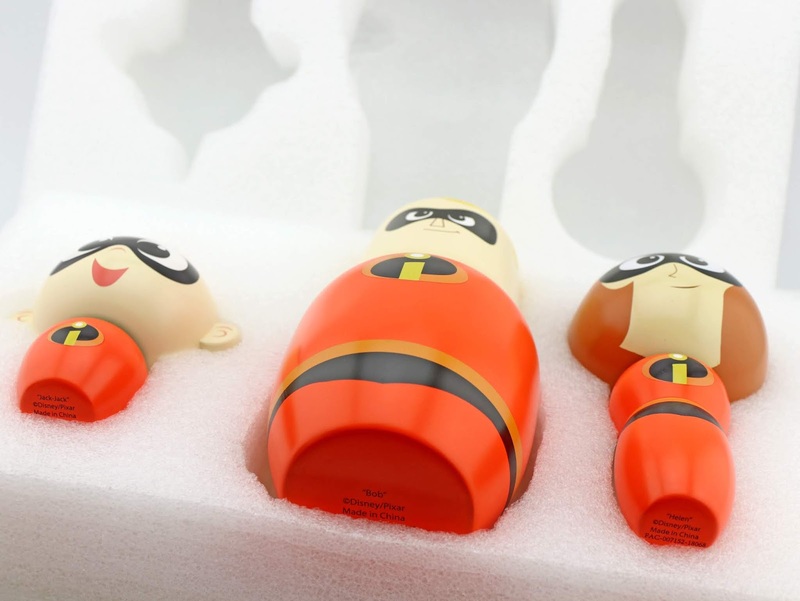 Will you pick these up for your Incredibles collection? 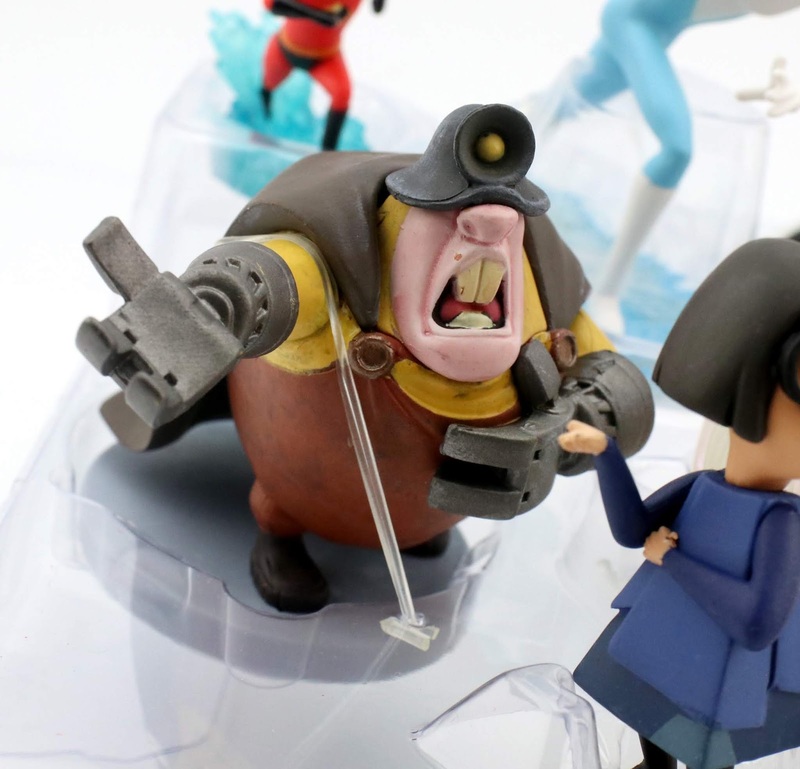 If you're a diehard Pixar fan/adult collector, then these are definitely for you. Find them at California Adventure (Knick's Knacks) or visit this direct link to current eBay listings. 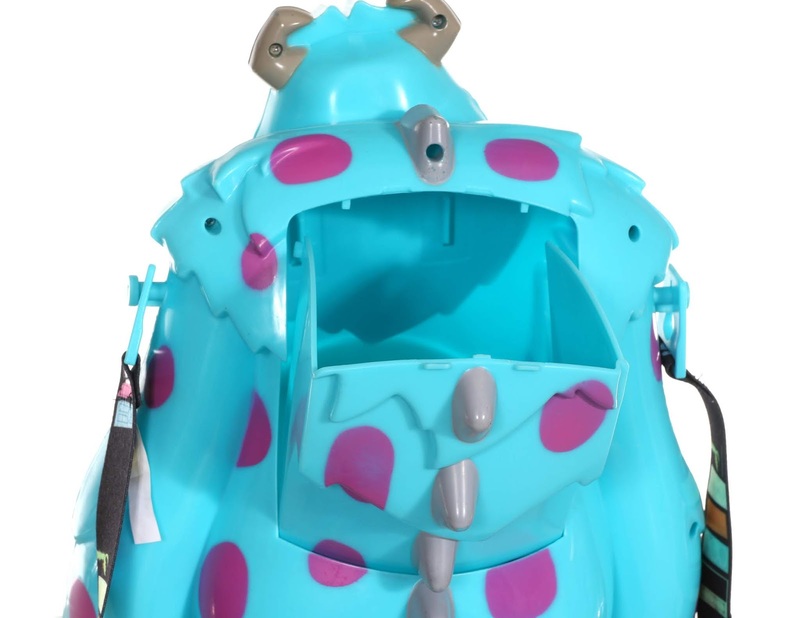 When this Monsters Inc. Sulley "Premium Popcorn Bucket" and Mike Wazowski "Premium Sipper" cup released at Hong Kong Disneyland early this year (around end of February), I couldn't help but hope for a US Disney Parks release. Lucky for all us here, they hit Disneyland Resort in April just in time for Pixar Fest! 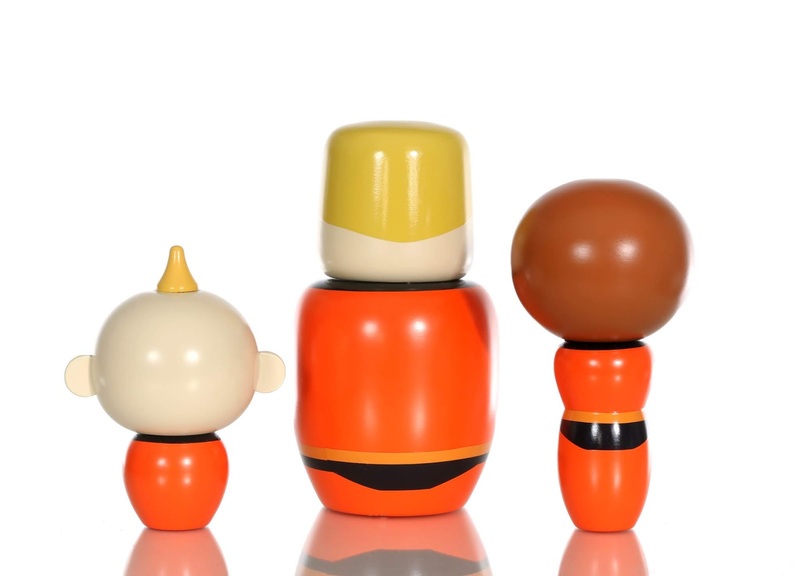 I want to shake the hand of the person who designed these because they are some of the cutest versions of these characters I've ever seen released as merch. 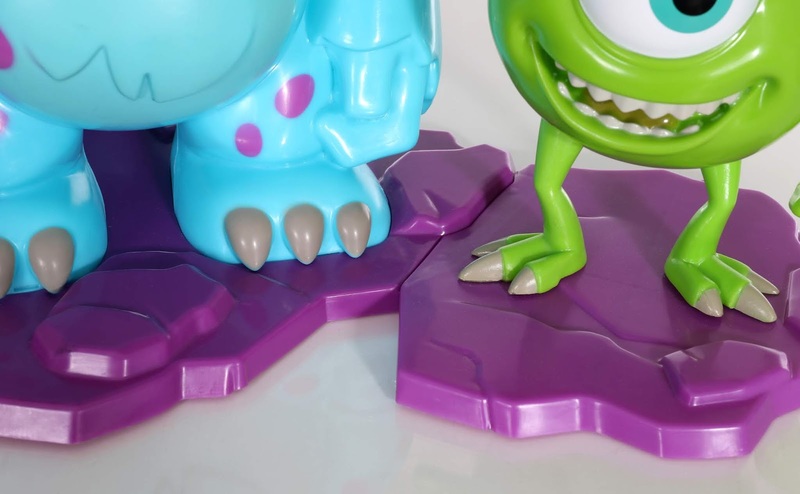 Perfectly stylized—especially Sulley! I don't usually collect novelty popcorn bucket type things from the Disney Parks (I know they're kind of a fad right now), but I could not resist falling into the hype with these ones. As seen all over Instagram and YouTube, people were clamoring for these and waiting in super long lines to get their hands on them. 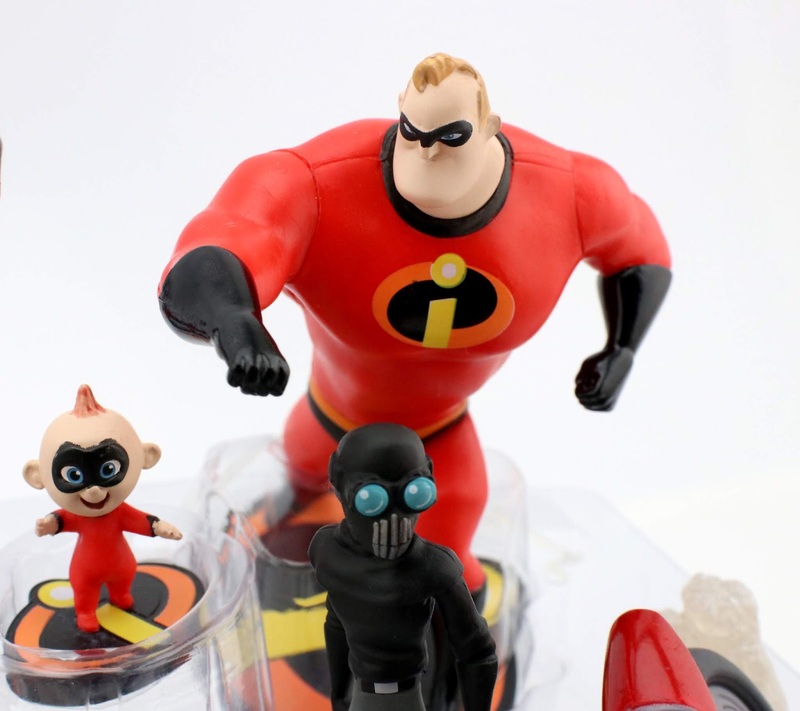 They quickly became the "must haves" of Pixar Fest and I can totally understand why! Ready for one of the coolest features? Their bases connect together. It's simple and maybe it shouldn't be so exciting to me, but I mean, come on! That's just awesome. How could you get one without the other? 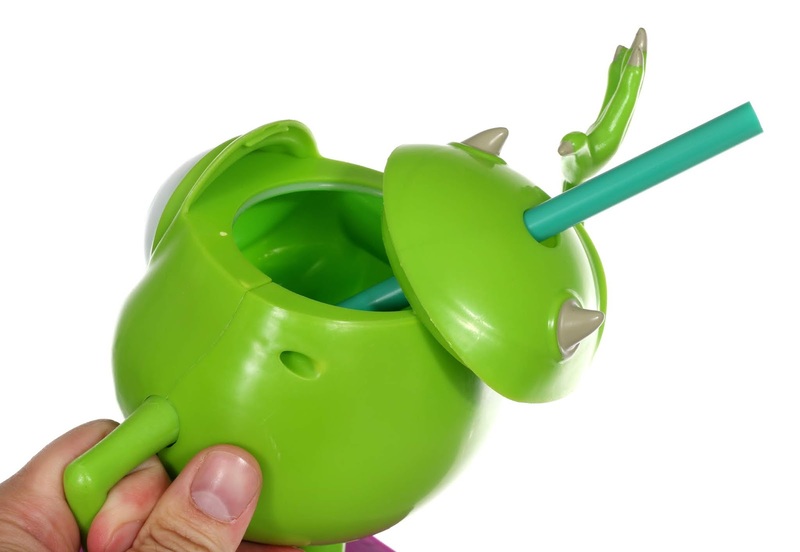 And honestly, I don't even care about the "popcorn bucket" and "sipper" gimmicks (I don't plan on even using them for those purposes, at least right now)...I just consider them amazing display pieces and have no doubt they'll look great on my Monsters Inc. shelf together. As far as size is concerned, they're pretty big. 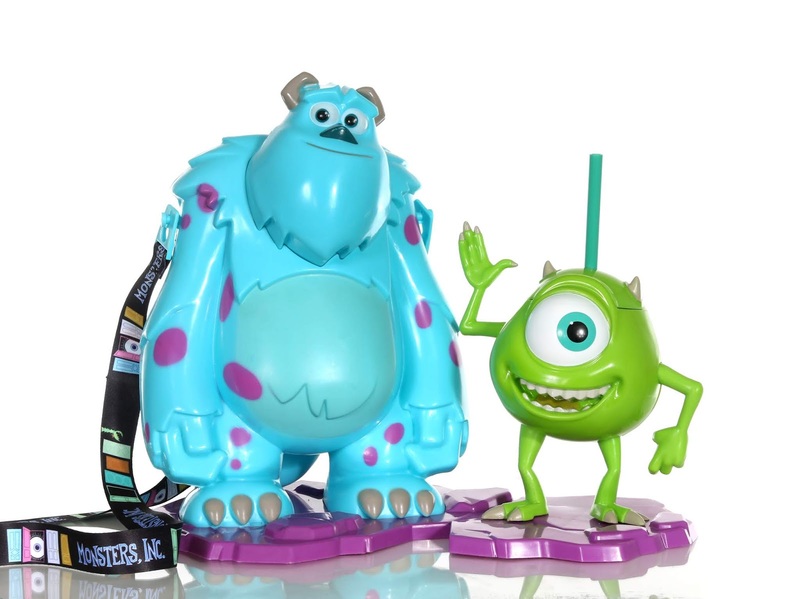 Sulley is roughly 12" tall x 8" wide (base is 10" wide) and Mike is 7" tall (about 9 1/2" if you count to the top of the straw) x 6" wide. I'm not sure if these are sold out yet (I know they did sell out at one point. 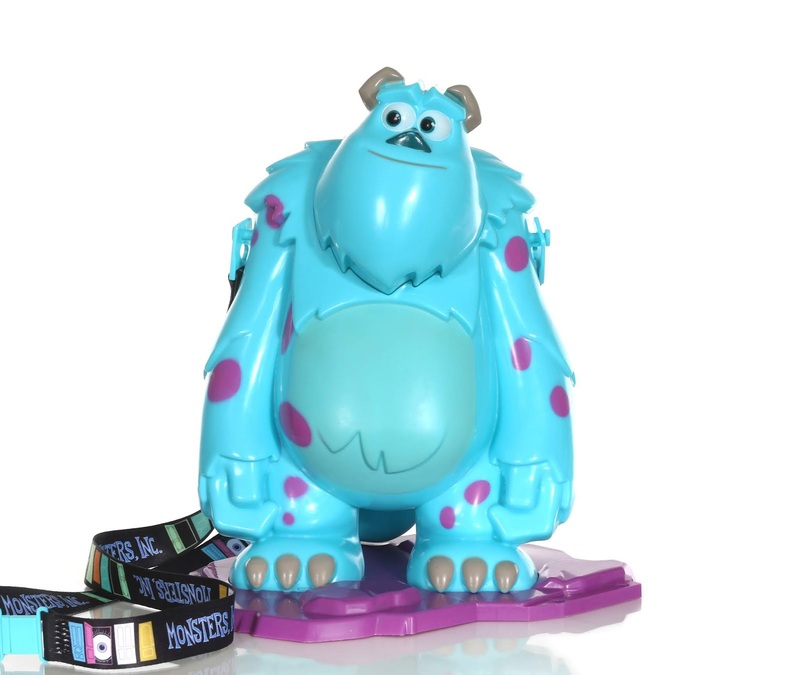 but they came back), but the price for Sulley is $20 and Mike is $15.99. Not cheap I know, but totally worth it for any big Monsters Inc. fan/collector. Let's take a closer look at each one down below! 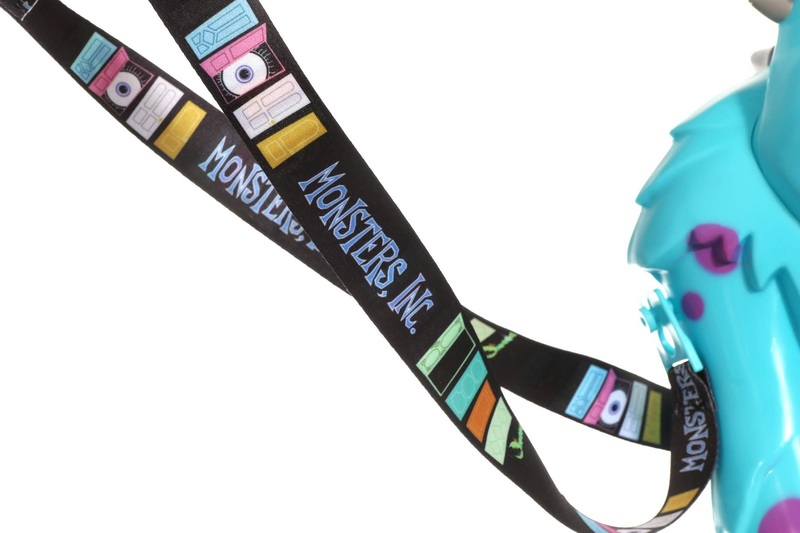 The next best detail is Sulley's strap, styled with the logo and doors from the film's opening title sequence! It's just perfect. The popcorn bucket feature can be accessed from the back. Just pull to open the compartment and load it up with the popcorn or any other favorite treat! 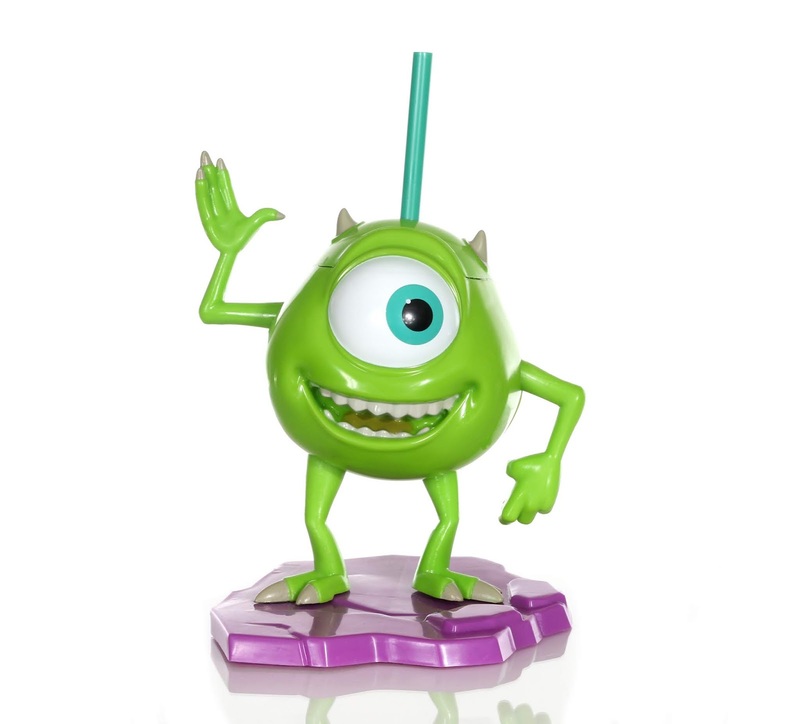 Just pop off the top of Mike's head (I know that sounds weird) to add your beverage! The straw is removable. I wasn't lucky enough to attend Pixar Fest this summer, but I am lucky to have some amazing friends!! A huge thank you to my friend and supporter Paulina (HeartDisney on Instagram) for going through the trouble of purchasing these for me and sending them my way. I'm so happy I decided to go for them! If you'd like to add these to your collection and aren't able to make it to the parks, be sure to check out current eBay listings HERE and hopefully you'll find them from a kind seller asking a reasonable price. Let me know what you think down below! Were you able to pick these up? I'd love to hear your experience. Hey everyone! So the reason I haven't been posting as many cars lately is because I wanted to finish reviewing all of last year's collection before moving onto the 2018 series. At this point though, there are still a few from last year that I still need to track down and it's taking [seemingly] forever. I decided to just move onto this year's cars and will get to the others when I can! 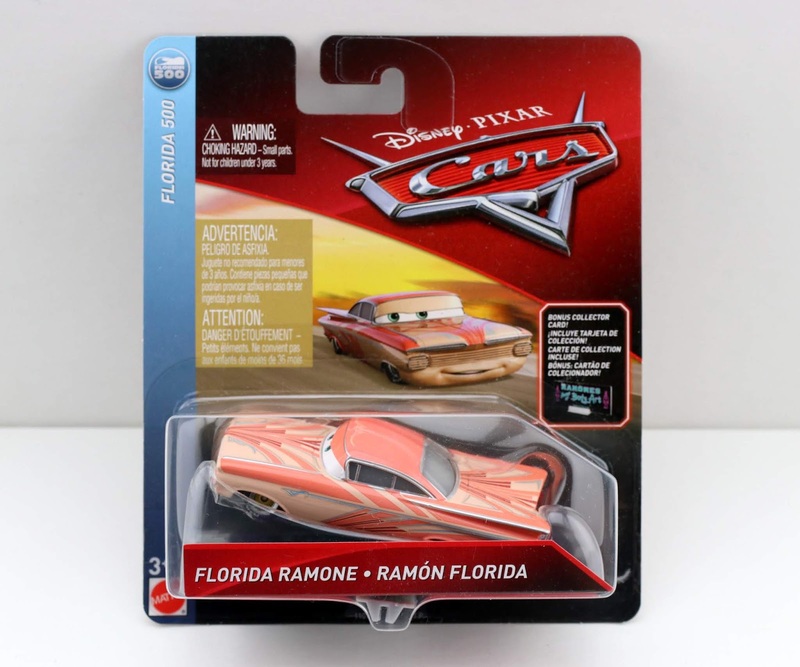 Today I'm taking a look at Florida Ramone from Cars 3—one of the very first singles released early this year. Per usual, this is a 1:55 scale diecast from Mattel. There is no numbering system for 2018, but categories are back. Ramone here is part of the "Florida 500" sub-series. 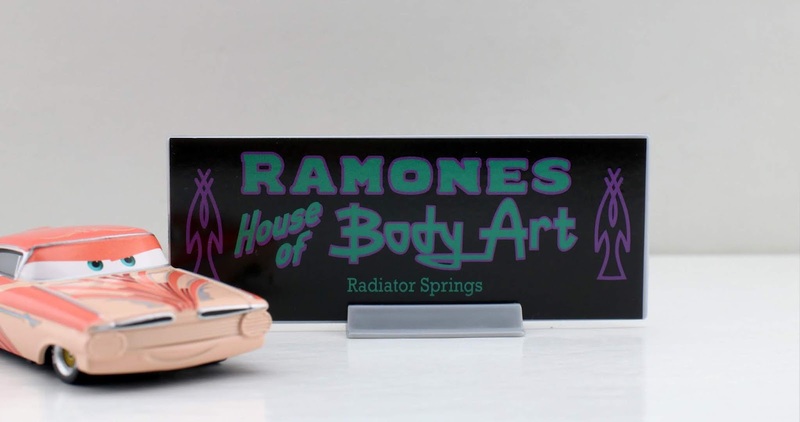 And this particular version comes with a neat Ramone's House of Body Art "Bonus Collector Card"/ stand! This same car has also been released in other cases without the card (I'm not sure which one is more rare). If you missed picking this Ramone up in stores, be sure to check it out on Amazon using the link below and let me know all your thoughts down in the comments! 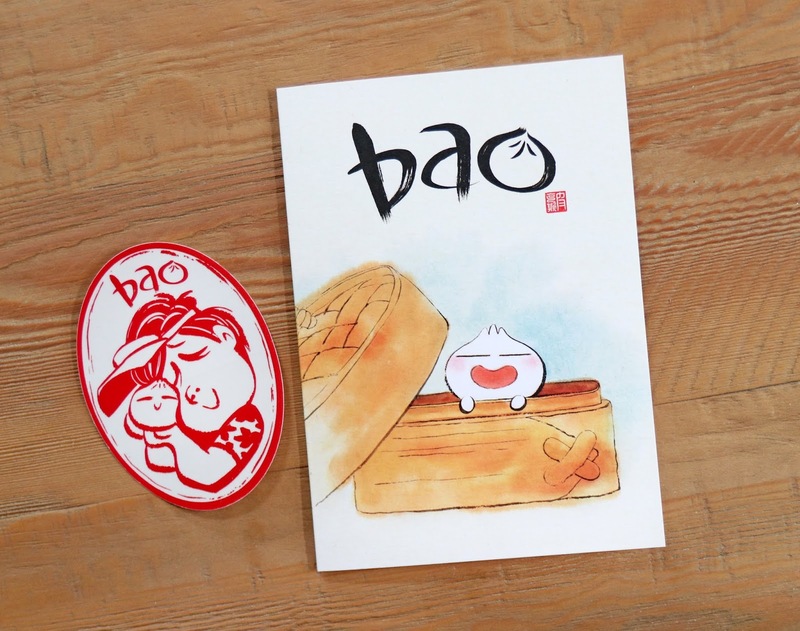 Straight from the Pixar Studio Store once again, here we have another exclusive Bao inspired sticker AND note card! Funny story—these were actually sent to me months ago (a big thanks to PixarPost.com for the sticker and Jerrod Maruyama for the card), but they got stuck within the pages of some of the other items I was sent and I only recently discovered them! When I took out my Bit of Boundin' book to review earlier this month, that's when I found the sticker. 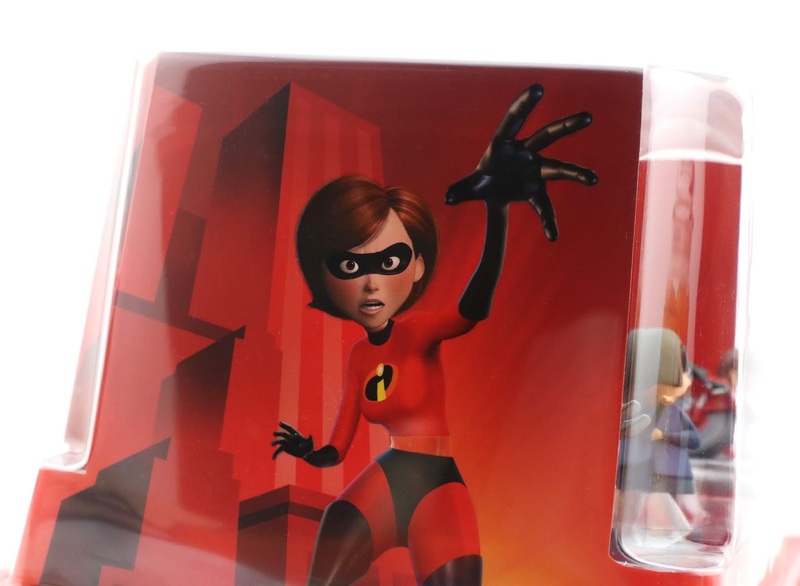 As far as the card, it had worked its way into the inside back pouch of the Incredibles 2 journal, which I also took out recently to review! Such fun little surprises to stumble upon. 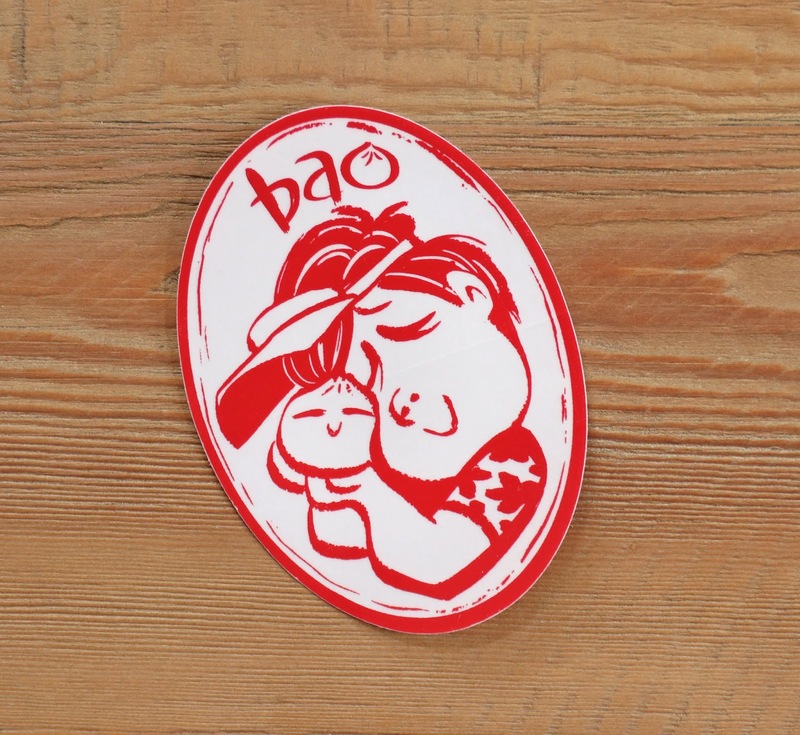 If you're a fan of the short film, you'll want to check out the other Bao stickers I was sent in my original post HERE (not to mention the wooden postcard I was gifted HERE). Which sticker is your fave? I love this one featuring a minimal illustration of the mother embracing her little dumpling. It really captures the heart and emotion of the film. The note card is also amazing. The adorable art is actually the same as what was featured on the short film's poster! I wish I new the artist to give them credit here, so if you know who it is, be sure to let me know and I'll update this post. 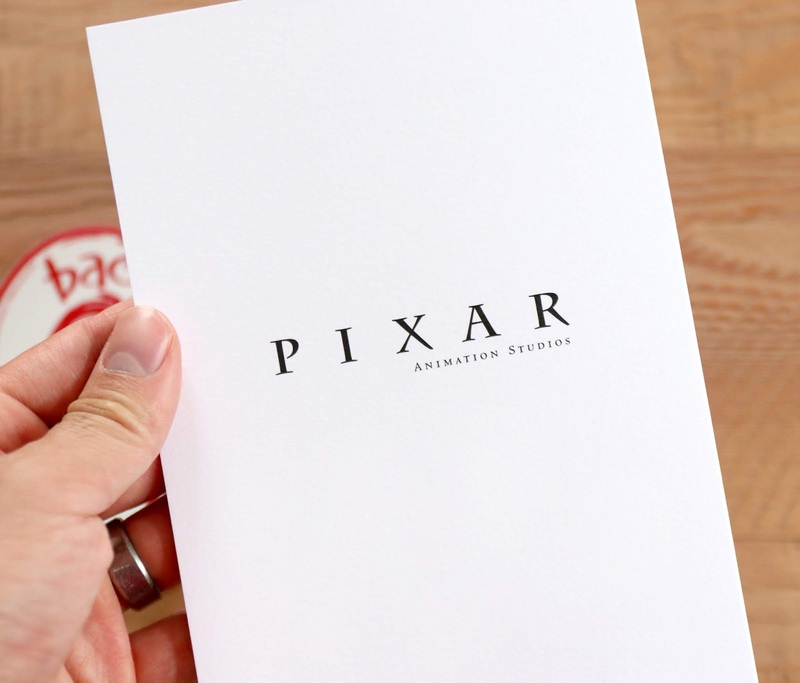 The inside of the card is completely blank and Pixar's simple, unaltered logo can be found on the back. Tonight I'm finally back for another quick Mattel Cars 3 1:55 scale diecast review! Wow, looking back, it seems I haven't done one of these since April. And I still have so many cars to share between last year AND this year! Phew, I better get on that. 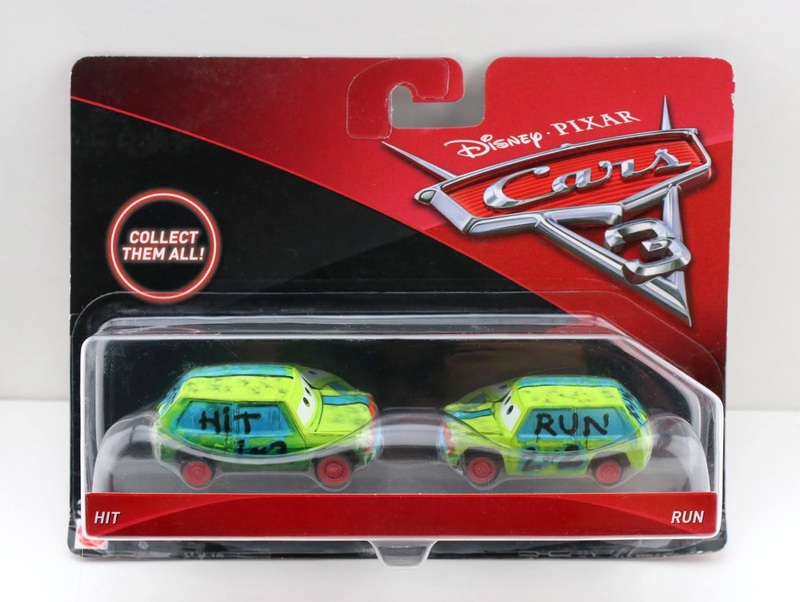 Anyway, here's my detailed look at one of my favorite 2017 releases, this Hit and Run 2-Pack! 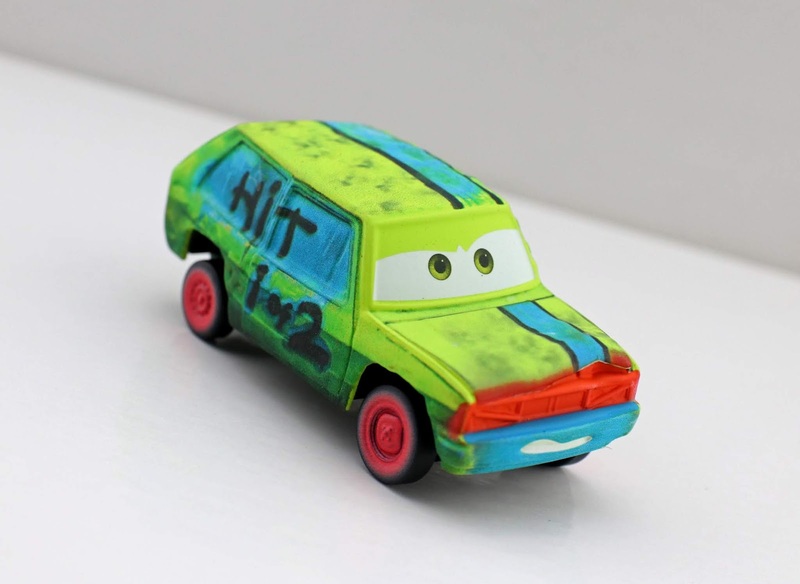 In Cars 3, Hit and his partner Run are two Thunder Hollow Crazy 8 contenders who appear to be "twins" (though I'm not sure if that's really the case; perhaps they just sport matching paint jobs). 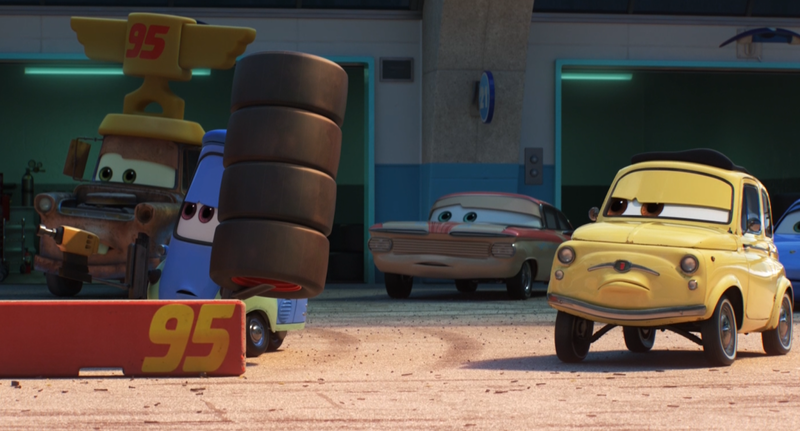 They can be spotted during the demolition derby scene and, as shown in the screen shot above, later on in the film when the Thunder Hollow cars are seen at a bar watching McQueen's final race on TV. This was one I never ended up finding on store shelves. 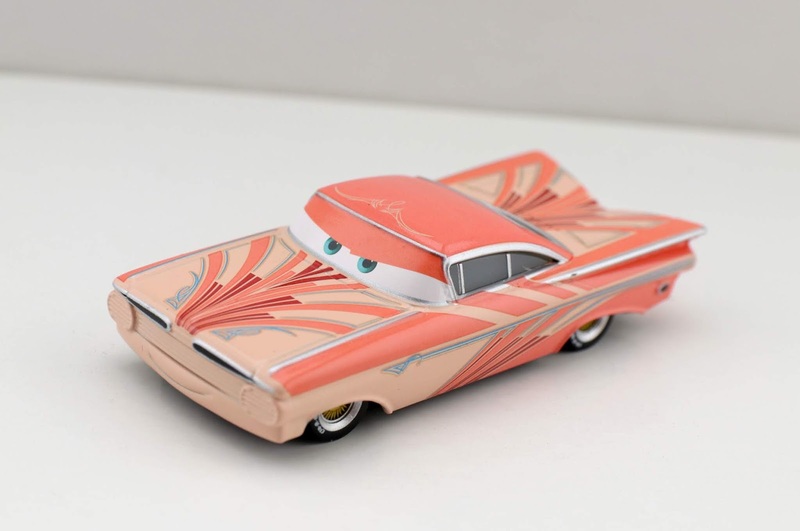 It literally was the hardest Cars 3 item for me to find from last year! After months of searching and waiting, I finally caved recently and just bought it on Amazon for around $12. I think it's the only thing from last year that I had to buy online. Well worth it though! Were you able to find this pack in stores? These guys are so unique and hilarious (love the "1 of 2" and "2 of 2" written on their sides). You know the demolition derby cars are my favorites to collect as of late and these two are no exception! They're so colorful with awesome matte finishes and feature all the great details (dents and weathering) I've come to expect by now. If you're looking to still add this 2-Pack to your collection, check out the Amazon link below or eBay HERE! I am shocked though—it seems since I purchased this just two weeks ago, its gone up to $48. That's crazy! I'd say just to keep checking as the price could go back down. 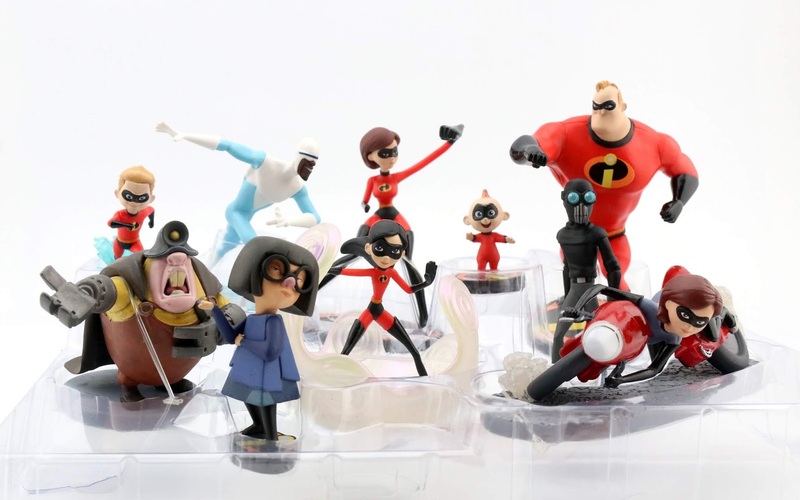 With each new Disney·Pixar film release, you can always expect a corresponding "Figurine Set" to hit Disney Stores soon before the film hits theaters. I've enjoyed collecting these over the years as they're a fun way to get a lot of nice looking characters for play or display...Incredible 2 was of course no different! I have to say, the quality of the figures in these sets has greatly improved since they started all those years ago. These ones look absolutely stunning! The sculpts are spot on and the paint jobs look [for the most part] very clean and precise. 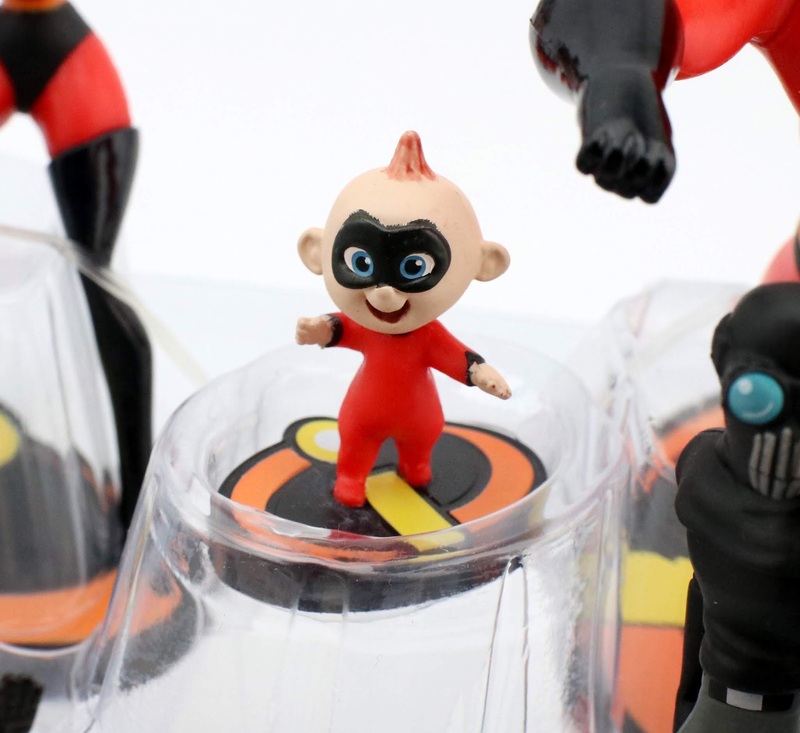 They are, like usual, made from a PVC material and are about 2"-5" in size (Jack-Jack being the smallest and Mr. Incredible being the largest). 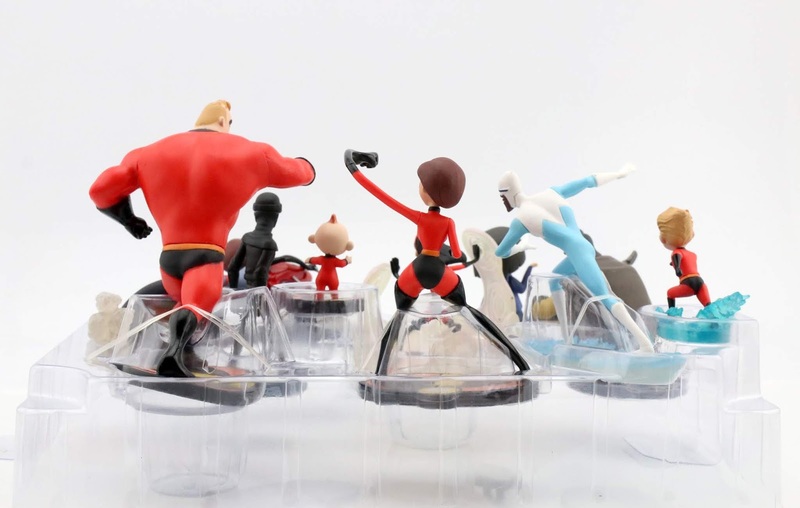 This set is a huge leap forward compared to the original 2004 The Incredibles figurine set as these figures are much larger, have way cooler bases and have much more epic/creative action stances. As far as the overall durability of these figures though, I can't promise they're "play proof". These figure sets do have a reputation for breaking relatively easily, but I have yet to experience that myself. For young kids who may be more rough with their toys, I can probably see the stands breaking off if tossed around too much. 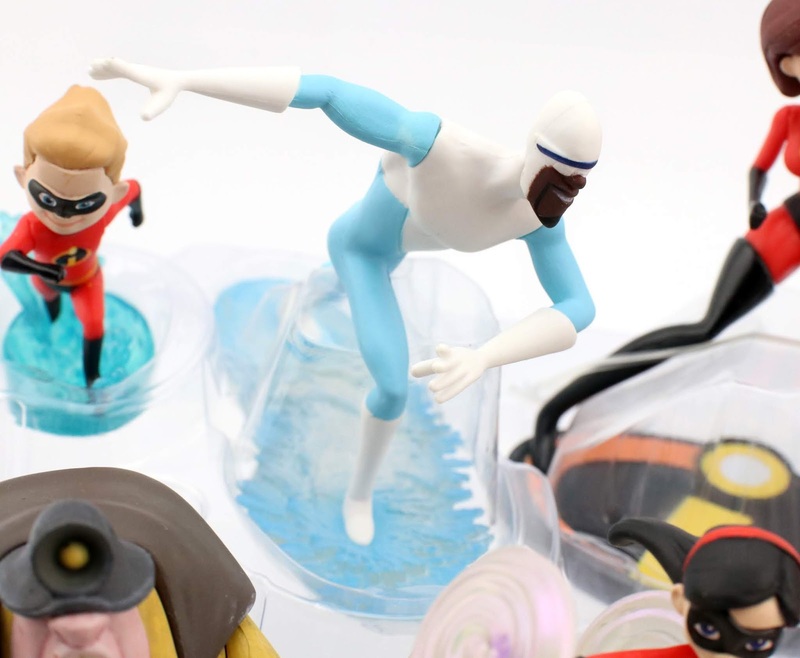 For kids who are a little older and adult collectors however, there shouldn't be a problem at all. 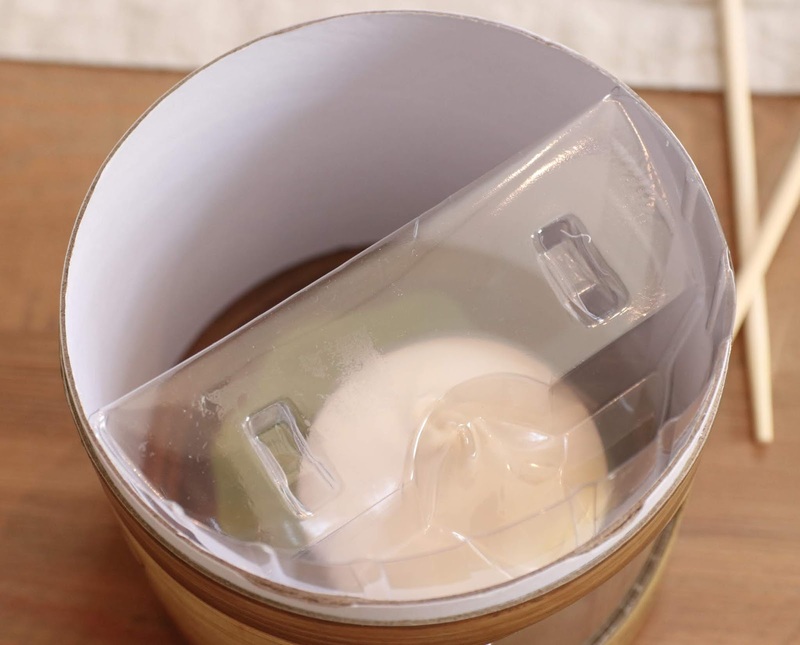 Just be careful when pulling them out of the plastic packaging since they can be pretty secured in there. 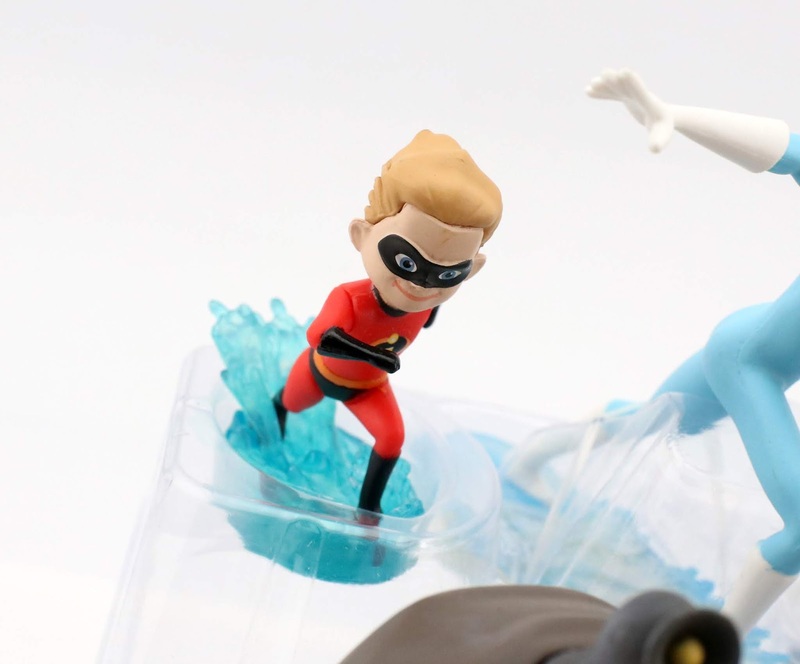 This set comes with a really nice selection of characters from the film (ten in total): Dash (with awesome translucent "running on water" base; more so inspired by the events of the first film), Frozone (with a real slick ice slide base, also translucent), Elastigirl, Jack-Jack, Mr. 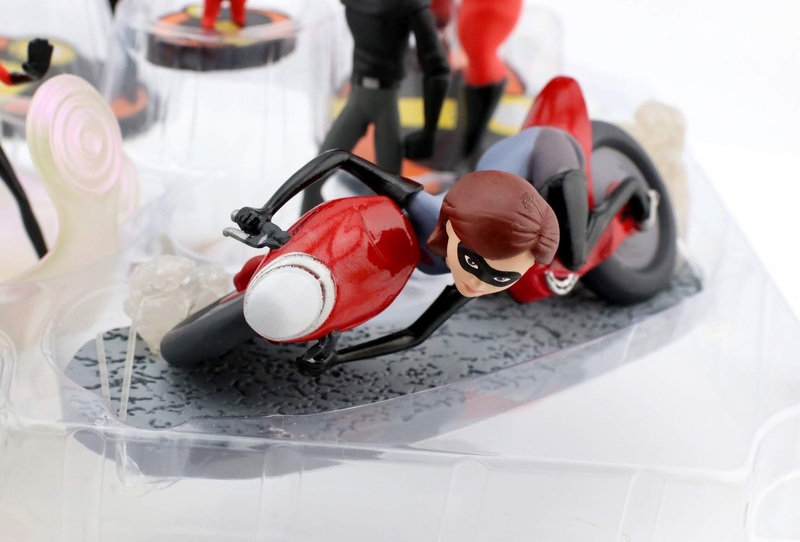 Incredible, Elastigirl on Elasticycle (my personal fave—just look at that sculpt of her in action! 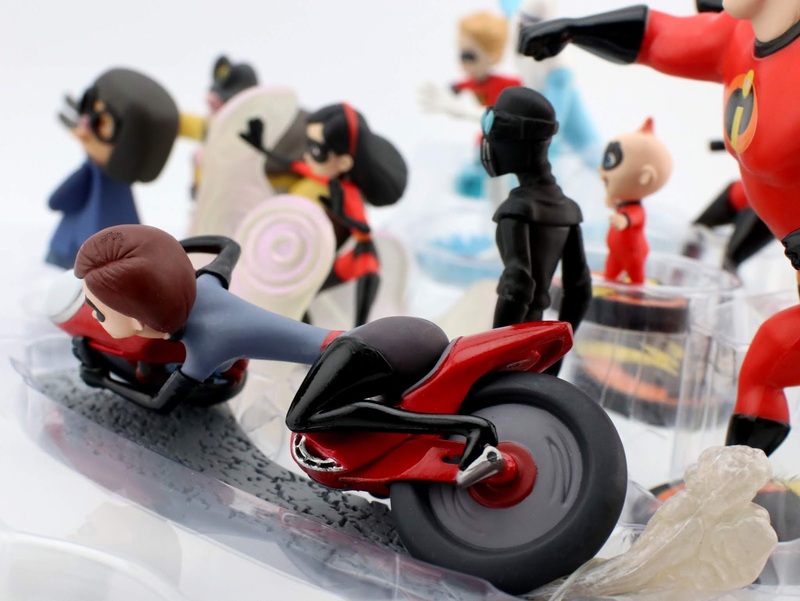 Love the road base and the sculpted smoke near the tires), Screen Slaver, Violet (with a super sweet force field base), Edna Mode and The Underminer. Lets take a closer look at each one! Huge props to sculptor Damian Szeibert (of the Disney Store product development team) for a job well done. I do have to say, not quite sure why the coloring of Edna's nose has a pinkish purple tint. That's the only choice here I question with this whole set (and thanks to one of my co-workers for pointing that out as a flaw—now I can't unsee it ;). For fans of the film, young or old alike, I highly recommend this set. You'll love it, especially if you're trying to track down most of the core characters in one easy go-around. 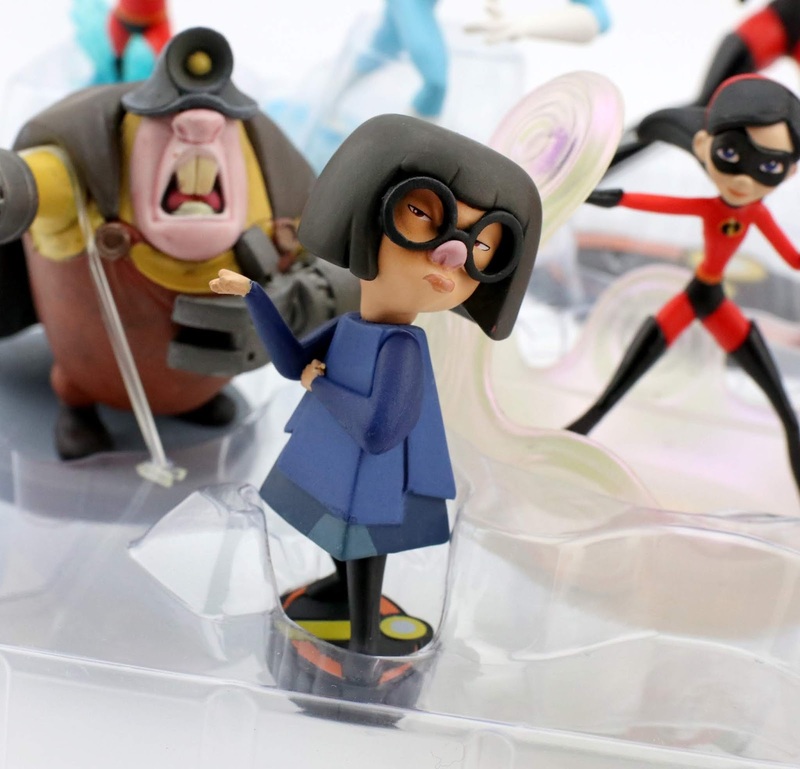 Once again though, I feel it was a missed opportunity to include some of the new, more unique characters from Incredibles 2 (couldn't they have added at least one of the new "wannabe supers" or one of the Devors?). It's interesting to me how there's (generally speaking) hardly any merch out there for any of those newcomers (really just a couple Funko Mystery Minis and that's it). What's going on with that? 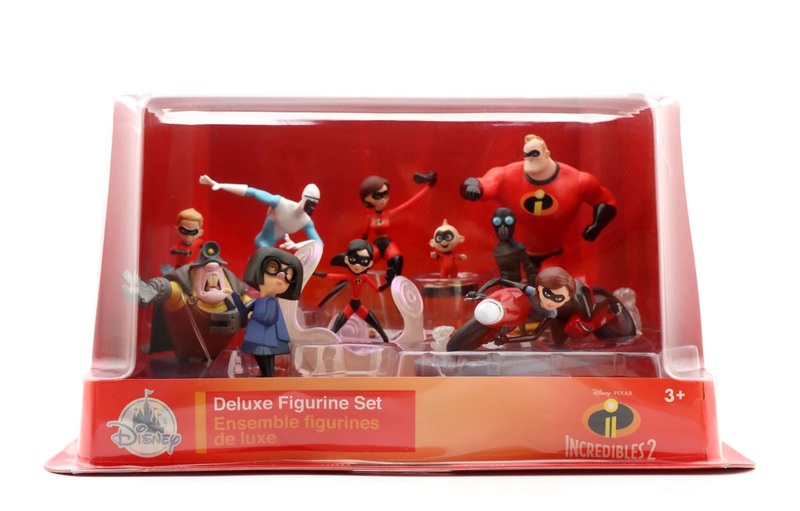 If you're looking to grab set for your collection, you can currently pick it up at your local Disney Store or online HERE for $24.95. Yes, the price for this one is a bit more than the Deluxe Figurine Sets of the past (which were usually $19.95); perhaps because the characters here are larger in scale/more detailed compared to previous releases? 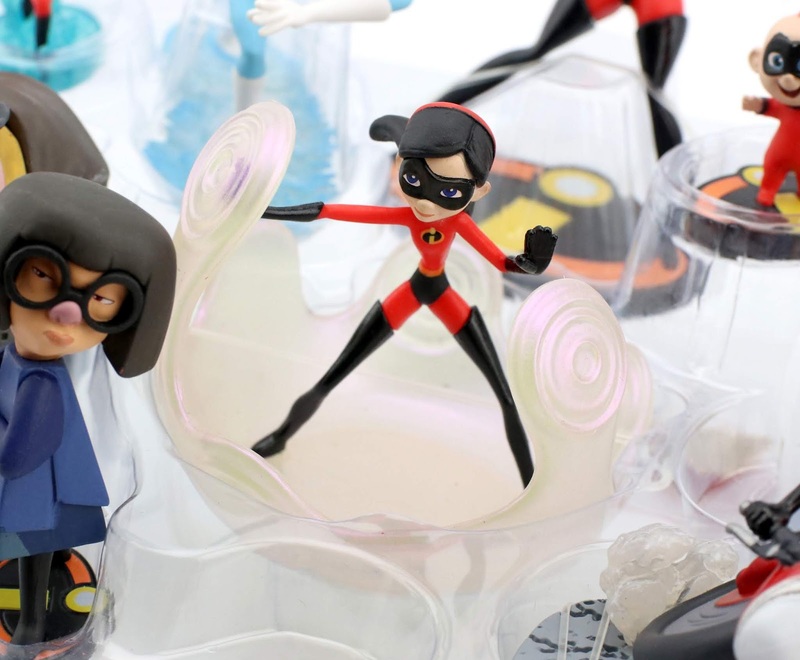 Or it just might be a general price increase for all Deluxe Figurine Sets moving forward. Either way, it amounts to $2.50 a figure, which isn't too bad. So what do you think of these figures? Have you also had a positive experience with them? Who's your favorite one? Let me know your thoughts in the comment section below and be sure to check back daily for more from my ever expanding Pixar collection!